Recently I passed my one year anniversary since I created this blog on September 17, 2014 during the Blogging 101 “Zero to Hero” workshop. I’ve just been very busy the past few weeks, and didn’t get around to announcing this milestone until now. Here’s a summary of my blog statistics. I have created almost 700 posts and 100 pages, including nearly 600 music posts. There have been almost 7,000 views by about 4,000 visitors with around 400 comments. Also, I have 194 followers via Email subscriptions, 155 on WordPress Reader, 31 from Twitter, and 8 through Facebook. I’m quite amazed that I am actually still doing this. It’s been fun and I’m enjoying it very much, and plan to continue. I have thoroughly enjoyed reading so many great blogs, meeting interesting people, and sharing my life and music that I like with others. Thanks for reading, listening, and following. Great news! I have reached another significant milestone. WordPress says that today I now have 1,000 Likes on my web site. Thanks for letting me know what you like. I’m glad that you’re enjoying the music, photos, and travel posts. It always helps to see that my blog is on track with its readers. Currently, I have 1,034 Likes from 6,111 Views (17% Liked) by 3,455 Visitors (1.7 views/visit). I have created 547 Posts and 80 Pages, and received 294 Comments. There are 137 WordPress followers, 167 Email subscriptions, 22 following on Twitter, and 8 on Facebook. The most views per day was 74 on November 7, 2014. I have really enjoyed my experience over the past 9 months since I started my blog on September 17, 2014. I reached 200 Likes on Nov 3 (first 2 months during Blogging 101), then 500 by Dec 15 (just 1 month during both Blogging 201, Photo 101, and Christmas music), and now 1000 (6 months later). It’s wonderful to meet so many interesting people whose blogs I get to read every day. I have been preparing a series of posts which feature my recent Viking River Cruise on the Rhine and extended trip through Germany. I took almost 4,000 photos during our three weeks visiting so many interesting destinations. It has taken quite a while reviewing and organizing my photos, including selecting highlights for sharing in my blog. I am creating a photo web site as a better way to store and share my photos, and I will integrate that with my WordPress blog. I expect to begin daily posts starting in the next several days. 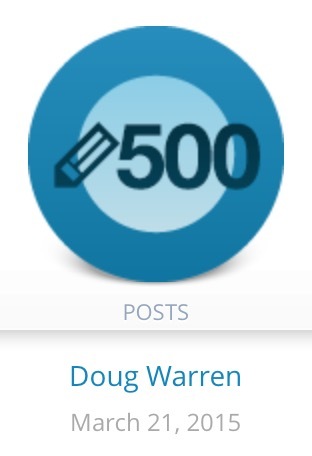 I passed another milestone now that I have created over 500 posts (and 76 pages) for my blog in just over 6 months since I started it during the Blogging 101 course. The majority so far have been about Music (422), followed by Photos (35) and Blog (35), then Travel (16), and finally Recipes (2). My blog has about 3,000 visitors with over 5,100 views, almost 900 likes, and over 250 comments. There are 126 WordPress followers, 153 email subscribers, 19 on Twitter, and 8 for Facebook. Thanks for visiting, reading, listening, and following. I passed another milestone with over 5,000 views. My blog has grown quite a bit since it was started only 6 months ago on September 17, 2014 during the Blogging 101 course. I have created 488 posts and 76 pages with 2,901 visitors, 869 likes, and 245 comments. There are 124 WordPress followers, 151 email subscribers, 19 on Twitter, and 8 for Facebook. Thanks for visiting, reading, listening, and following my blog. Here’s a summary of milestone achievements for the Blog Goals that I established for February 2015 when I participated in Blogging 201 and Writing 201: Poetry. I have reached my target goals to expand readers and traffic with views, posts, likes, and comments. I had not set any goals for site visitors or email subscribers, but those have increased. Although improving, I came up short with followers on Wordpress Reader, as well as Twitter and Facebook social networks. For each Target, here are the Goals with the Current statistics and amount Over (on Feb 28), as well as the starting Base count (on Feb 2), along with Growth % for the Increase (Current – Base) over the past month. Many music artists have favorited and/or retweeted my posts on Twitter during February. This includes several replies with thanks and blog compliments, and those with an asterisk (*) are even following me: Michele McLaughlin*, Philip Wesley*, Fiona Joy*, Christine Brown*, Tim Glemser*, Doug Hammer*, Brad Jacobsen*, Vin Downes*, Ed Harris*, Joseph Akins, and Michael Logozar, as well as Austin Town Hall*, Texas Music Office*, and SXSWfm. Also, I have successfully extended my blog’s content. Besides my Twitter activity and interactions, I have increased range and diversity beyond music with my poems from the Writing 201: Poetry workshop. I will continue to create additional posts with travel, photo, writing, and other blog topics that will interest more readers and realize the focus described on my About page. For Writing, I took the plunge and participated in the Writing 201: Poetry course so I could learn more about poetry. Although I considered this to be quite a stretch for me, the challenge interested me so I registered to give it a try. Actually, I was quite surprised that I composed six poems (Water, Journey, Trust, Animal, Fog, Hero) by the end of the two weeks; however, I still have four more to finish over the next several days (Fingers, Drawer, Landscape, and Future) since I got a little behind. Regarding Photos, although I didn’t start participation in weekly photo challenges yet, I have been following them and intend to join them during March. I considered registering for Photography 101 again since I enjoyed it so much the first time, especially with all the community interaction. However I decided that I will involved in photo challenges instead, while also trying to follow the assignments as well. Finally, I have enhanced my brand with the initial focus on site’s sidebar and menus. I reviewed my site for possible improvements and focused on overhauling my sidebar, where I removed many of the widgets that had been incrementally added over the past several months. Based on constructive reader feedback during my Blogging 201 refresher, I tried to simplify it as much as possible, and comments have been favorable about the site being much cleaner now. I’m currently examining my site organization and menu structure for further refinements, where some updates are needed, redundancies eliminated, and general simplification. Reviewing blog statistics, as well as likes and comments, has helped with this analysis too. I still need to determine whether another blog title, tagline, and theme would be appropriate. I have started efforts to provide renewed focus for older content, such as music and photos. With music, I created a series of Music Roundups by genre (Country, Americana, Pop, Folk, Indie, Alternative, Piano, etc.) with links to earlier music posts grouped by month since September when I started the blog. Also, more recently I have just started creating Playlist posts for existing music artists on my web site such as George Strait and Tim McGraw, and will continue that during March. I’m already doing that for all new music posts with recent ones like Brandy Clark, The Band Perry, Rod Picott, Slaid Cleaves, Meiko, Stars, Lenka, Ruby the RabbitFoot, The Head and the Heart, The Aikiu, Family of the Year, Michele McLaughlin, Philip Wesley, Ed Harris, and Conspirare. Over the next several months, I will be including more posts for Travel, Photos, Writing, and Recipes topics, as well as Music. Our first assignment for Blogging 201 (Feb 2015) was to set three goals for our blog. First, I thought it would be helpful to understand my current status and site statistics for the past 5 months since I started this blog. It seemed like that might help me to determine realistic targets that I might be able to achieve this month. See my post Blog Goals – Feb 2015 which describes the goals I established in Blogging 201 (Feb 2015) to accomplish by the end of this month. Originally, I included these statistics there, but decided to extract it into this separate post since it really was just background details that everyone might not be interested in. Currently, I have created 383 posts, for an average 2.5 posts per day. They have had 3,955 total views by 2,149 unique visitors to my site, for an average of 26 views per day with 72 being the most in a single day. There are 104 WordPress followers reading my blog updates, as well as 120 Email subscriptions, 10 Twitter followers, and 7 Facebook followers. I have received 216 comments from readers, and there have been more than 715 likes on my posts. Here’s a summary of monthly site statistics since I started my blog that some might find interesting. I just started my blog on September 17, 2014 during the Blogging 101 (Zero to Hero) workshop. Then I followed that right away with Blogging 201 (Branding and Growth) in October as well as Photography 101 during November. In December, my posts focused primarily on Christmas music. Now I’m taking Blogging 201 again in February to help me kick off 2015 by enhancing and growing my blog further. I have really enjoyed blogging much more that I expected. I had been thinking about doing a blog for quite a while when I started it almost 5 months ago now, and it’s quite a surprise to see how it has evolved so far. I thought now would be a good time to do this 2-week Blogging 201 challenge again since it helped so much last time. This refresher might enable me to extend my blog more with another kick start to refine my brand, build my audience, grow my traffic, and resurface older posts. To help determine realistic goal targets, I analyzed the current status of my blog as well as site statistics summary over the past 5 months, and the results have been extracted from here and are now available in a separate related Blog Statistics – Feb 2015 post, if you are interested in such details. Assignment #1 (Set Three Goals) asks us to consider what we want to accomplish with our blog, and identify three concrete goals that we want to achieve. Therefore, I would like to accomplish the following goals by February 28th. Expand readers and traffic. Reach these specific targets measured by my blog site statistics: 450 posts, 4500 views, 150 followers, 250 comments, and 800 likes. Also, grow blog access via social networks by expanding followers to 25 on Twitter and 15 on Facebook. Extend my content. Increase range and diversity of my posts beyond music so that there will be more travel, photo, recipes, writing, and other blog topics that will interest more readers and realize the focus described on my About page. Enhance my brand. Review my site for possible improvements in blog title, tag line, theme, sidebar widgets, and site organization. Provide renewed focus for older content, such as music and photos. Participate in weekly photo challenges. I appreciate all my followers, their comments, and enjoy reading so many great blogs. Also, it has opened new areas for me, such as composing articles, writing stories, sparking interest in photography, and even reading poetry. And of course, there’s still the music and I want to keep making continual improvements as I refine my blog’s brand and extend its growth and reach a wider audience. I’m looking forward to my blog reaching another level with thanks to the Blogging University staff and all my fellow bloggers. Thank you for helping me reach my goals. If you’re curious, you might like to see My Blog Goals and Blog Goal Achievements posts from the earlier Blogging 201 workshop in October 2014.